This past week I had three Time Outs. It was heavenly. Saturday was a bridal shower for my dear cousin. I took Faye with me, and we spent a lot of time visiting and conversing and playing. I learned, hummus at a bridal shower is purely genius. My cousins are the most talented chefs this side of Antarctica. The bread salad which I had never heard of before, was gorgeous! Note to self: get the recipe from cousin Sarah. After the scintillating conversations, I went to a new favorite store. I had only been in it one other time, and that was when I was a missionary in search of dishes. I am somewhat in love with Ikea now. Holy store of the heavens, where have you been all my life? I forgot how wonderful that store is. It is amazing! Sigh. When I die, I want to go to Ikea. I found some gorgeous bedding for Keith's big boy bed. Red sheets, and a lovely olive green bed spread with darling illustrated animals all over it. I want a bed like that for me. I am anxious for the day when Jeffrey gets a job so I can go back for bedding for Faye. They will be all matchy matchy, but not the same. I swung by my mother in law's house and put his bed together, and it is darling. I am excited for him to live in it. Truth be told, Keith isn't overly thrilled about it, but I am the mom, and I am super excited about it, so he is going to have to live with it. Live with an incredibly awesome bed. Sigh. I wish I could have his bedding. For my second Time Out, I went out with my friend Heather. We went to the Sweet Tooth Fairy. 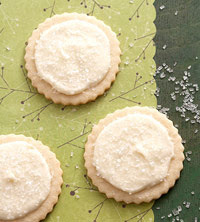 Their sugar cookies are oh so good! Then we went to Nelson's Frozen Custard. Heather got ice cream, and I got onion rings. They were okay, but the time spent visiting and laughing was the best. For my third Time Out, well, I am enjoying it right now. The kids are both in bed, and though I should be packing, I am extremely moody today, and so I am watching Ramona and Beezus. I loved the Ramona books as a child, so I couldn't pass it up when I saw it on Netflix. I am trying to fill my well, so I can be more than the usual useless that I have been lately. I have not been very motivated to pack lately, so not a lot has been done. I am not sure how effective this particular Time Out is going to bed, but I am enjoying it. What have you done for your Time Out? AWESOME time out! :) So sorry I didn't make it down there yesterday. My brother got his mission call. :) Hope you're finding more time outs this week! We might want to get a bigger house. I could spend HOURS in Ikea. LOVE that place. It's dangerous too. lol! AHHHHHHH shoot. I totally spaced sending you the pictures!!! Sorry. I am an idiot. I will do this. I will do this. I will do this.